The Palace of the Kings is a large castle at the far end of the Valunstrad district in Windhelm. It is home to the hold's Jarl, Ulfric Stormcloak, and headquarters of the Stormcloaks movement. 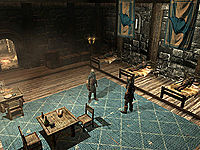 There are four zones in the palace: Palace of the Kings, Palace of the Kings Upstairs (southern section), Palace of the Kings Upstairs (northern section), and Windhelm Barracks. There is also a small courtyard to the front of the palace. The palace sits at the far end of Windhelm, on the opposite side of the city from the gates. There is an extra wall built between it and the city. Windhelm was one of the first human cities in Tamriel, and also the capital of the first empire (which was founded by Ysgramor). The palace is also one of the last buildings remaining from that era. * These people die if the Empire seizes Windhelm. ** Captain Lonely-Gale was intended to serve as Brunwulf's steward, but he does not due to a bug. See his page for details. *** This person is removed from the game if the Empire seizes Windhelm. 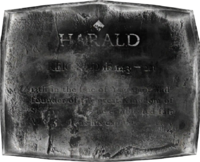 † Thongvor, Reburrus and Yngvar are only exiled from Markarth if the city changes hands twice, which can only happen through doing the quest Season Unending, and then progressing through the Civil War on the Imperial side. Joining the Stormcloaks: Prove yourself worthy of being a Stormcloak rebel. The Jagged Crown: Find this crown for Ulfric Stormcloak. Message to Whiterun: Deliver an axe to the Jarl of Whiterun. Battle for Windhelm: Conquer the Stormcloak capital and bring Ulfric to justice! The Palace is the furtherest building from the main gate to Windhelm, along the Valunstrad or "Avenue of Valor". Two guards patrol the courtyard, walking around the two braziers near the building. Another brazier is near the entrance to the courtyard, and the beggar Silda the Unseen often stands here trying to warm herself. There are two doors which both lead to the Palace of the Kings. There are two side entrances to the courtyard, one to the west that leads to the residential part of the Stone Quarter, and the other to the east which leads to the more opulent homes above the Gray Quarter. 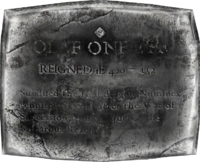 There is some rubble lying in the courtyard, but there are no signs of damage to the surrounding buildings, and there are two plaques either side of the entrance, one to Harald and one to Olaf One-Eye, both former rulers of Windhelm. 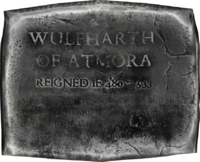 Another plaque to Wulfarth of Atmora can be found outside Candlehearth Hall. Skyrim of the Alessian heresy. The Main Hall runs the length of palace. It has two main features, a long table, and a throne carved from a large piece of stone. Either side of the entrance are the doors to the upper level and the barracks, and at opposite end of the hall are the war room and the kitchen. Through the war room is another door to a separate section of the upper level of the palace. The throne, set on a plinth, has a weapon plaque carved above it, two swords behind a shield with the Bear of Eastmarch on it. All this has been carved from one large piece of stone, and two small braziers have been set on it to provide some light. On the table, among the food, there is a potion of healing and a potion of stamina. The War Room is to the west of the throne. The centerpiece of the room is a table with a map marking important tactical locations for the ongoing Civil War. There is an iron sword on the table, and on a long table to the south is an assortment of weapons and armor, including a Stormcloak cuirass. To the north is the entrance to the Upstairs with the jarl's bedroom. The kitchen is to the east of the throne. The cook, Sifnar Ironkettle, spends his days here cooking and cleaning. Counterclockwise around the room there is a long table used for food preparation, a cooking pot, and spit by the fire opposite the entrance, three sets of shelves, and a bedroll. The bedroll is unowned and you can sleep in it, if it's not being used. On the table is a bottle of Alto Wine, two pieces of bread, three garlic buds, a gourd, two green apples, a leek, a leg of goat, a mammoth snout, two potatoes, two red apples, a salt pile, a tomato, and a piece of venison. Hanging above the table are two pheasants, two rabbits, two elves ears, two frost mirriam, and three garlic braids. On the middle of the three shelves is a large amount of cheese. The southern section of the Palace of the Kings Upstairs has five rooms, one of which belongs to the local court wizard, Wuunferth the Unliving. There are usually two guards patrolling the small corridors, which split to two rooms on either side, and a fifth (Wuunferth's) at the end. The first room on the left is a dining room. There is a rectangular table with four chairs in the middle of the room, a small round table with two chairs to one side, and a fireplace on the other. There is a cupboard to the left of the door, and a cupboard and a bench on the other side of the room. The cupboard by the door holds a copy of the Heavy Armor skill book The Knights of the Nine and a bottle of Nord mead. On the cupboard on the other side of the room are copies of Lost Legends (a quest starter book), 2920, First Seed, v3, and Argonian Account, Book 1. The other three rooms are basic bedrooms with very little decoration or items in them. The second room is a communal bedroom, with four beds, a wardrobe, a dresser, and an end table. The beds are set apart with two back-to-back. The first room on the right has two beds, set apart from each other, and a wardrobe. The second room on the right has two beds, two end tables, and a small table with two chairs. There is a coin purse on the table, and an iron dagger on the long end table by the far wall. The last room belongs to Wuunferth. There is a trove of ingredients and potions in the room. The main feature of the room is an arcane enchanter. Around the room, clockwise from the door, is an end table, a bed, an alchemy lab, three round tables, a set of shelves, a table, and another set of shelves. On the three round tables there are two giant's toes, a nightshade, a giant lichen, a deathbell, two butterfly wings, a luna moth wing, two blue butterfly wings, a bowl of vampire dust, a petty soul gem, and a lesser soul gem. On the shelves beside the door are three potions—a conjurer's philter, a conjurer's draught, and a philter of Destruction—three bowls of glow dust, two bowls of ectoplasm and troll fat, and one bowl each of bone meal, vampire dust, frost salts, and fire salts. On the table is an unusual gem, a creep cluster, a solution of lasting potency, a draught of Destruction, a scroll of blizzard, and a scroll of harmony. Finally, on the other set of shelves is another solution of lasting potency. The northern section of the Palace of the Kings Upstairs has five bedrooms, with the main one belonging to the Jarl. The first four bedrooms each contain a double bed and some sparse furniture, while the fifth, the Jarl's, is far more opulent, with better lighting and a more dynamic design. Two guards patrol the small corridors. The first room on the left contains a bed, a wardrobe, two end tables, and two chairs. The second room on the left contains a bed, two end tables, a set of shelves, and a table with two chairs. The first room on the right contains a bed, a wardrobe, two end tables, and a table with two chairs. This bed is not owned and can be used by anyone. The second room on the right is used by Yrsarald Thrice-Pierced; it contains a bed, a wardrobe, and three end tables. The final room belongs to the Jarl. It is larger and more finely decorated than any of the others. 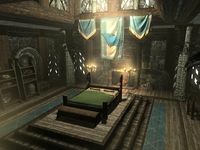 The Jarl's bed sits atop a raised wooden platform in the middle of the room, above which there is an extended roof allowing for more windows, and therefore more light, to get into the room. There is also an adept-locked chest at the foot of the bed. Counter-clockwise around the room, there is a wardrobe, a table (with a salt pile and a bowl of bone meal), then an empty chest, some shelves, and finally a table with two chairs. Among the books on the shelves is a copy of The Legend of Red Eagle (which is a quest starter), and on the table by the door is a potion of minor healing. 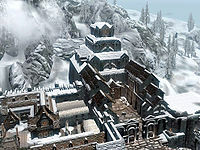 The barracks, also known as the Bloodworks, are the off-duty and resting area for the guards of Windhelm, as well as the location of Windhelm's jail. The entrance to the barracks is to the right, inside the palace. The first room is the guard barracks. There are four beds, three tables with two chairs each, three sets of shelves, a wardrobe, and the prisoner and evidence chest. The four beds are along the right-hand wall, while the tables are to the left-hand side of the room. There is a sweetroll on the first table, a set of iron gauntlets on the second one, and a couple of books on the last one. There is an iron dagger on the first set of shelves, banded iron armor on the second, and three books on the third set. The well-lit corridor to the south leads around and down to the jail cells. There are four locked cells in the jail, and in running order they have a master lock, an expert lock, another expert lock, and an adept lock. One of the barrels in the corner contains a bottle of lotus extract. There is nothing else of interest in the jail. A copy of the Block skill book The Mirror spawns on the table with the bone meal in the Jarl's bedroom when Captian Aldis's version of Rare Gifts is started. If you sided with the Imperial Legion during the Civil War questline, most of the displaced Jarls, along with certain members of their courts, will move to the main hall of the palace. 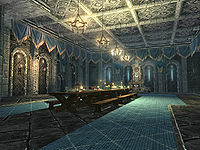 If you complete the Civil War for the Empire by killing Ulfric and retaking Windhelm for the Legion, guard patrols in the Palace will become comparatively lax - there will no longer be guard patrols in the upstairs rooms, for example. The same is true for Castle Dour should you side with the Stormcloaks. This page was last modified on 18 May 2018, at 21:47.